As stated in Ch.7 of the book of Kings I, King Solomon ordered Hiram from Zor to make, among other things, a molten sea. "And he made a molten sea, ten cubits from the one brim to the other: it was round all about, and its height was five cubits: and a line of thirty cubits did circle it round about" (Kings I, Ch. 7:23) (see the side view and the view from above). Since the diameter of the vessel was 10 cubits and the circumference 30, their ratio was 3. Quite a poor approximation of the number π=3.1415…! Perhaps the diameter of 10 cubits included the thickness of the walls of the vessel, while the perimeter was measured from inside? Indeed the Talmud in Iruvin 14a makes such a suggestion. However it is rejected immediately. The Talmud cites the verse 7:26 which says "and it was a hand breadth thick, and brim was wrought like the brim of a cup, like the petals of a lily". The Talmud infers from this sentence that the thickness of the brim was negligible. Besides, the Talmud claims that both measures: the diameter and the perimeter are the inner ones. The Talmud comes from it to the conclusion that the ratio of circle to its diameter is 3! In the sequel the Talmud discusses the volume of the vessel. At the end of the verse 7:26 is written: "it contained two thousand bat". The "bat" equals 3 seah while 40 seah make up a miqveh of 3 cubic cubits. Hence the volume of the sea was 450 cubic cubits. The Talmud however calculates the volume of the cylinder assuming that π=3 and arrives at 3∙52∙5=375 cub. cubits, i.e. 5/6 times less than required. Then Talmud quotes an external source ("braita") saying that the Solomon sea for the first 3 cubits of its height was square and for the next 2 cubits was round. Hence the volume of the sea was 102∙3+3∙52∙2=450, exactly as stated in the book of Kings! Is it possible that the sages of Talmud thought that π is exactly 3? Even a rough measurement would show that π is larger than 3! The approximation of π by the ratio 22/7 was known in the ancient time. It is impossible to imagine that King Solomon, the wisest of all men, did not know this elementary fact. And at the same time he was able to manufacture a gigantic copper vessel of a given size and volume. Somebody drew attention to the fact that the word "line" in the verse 7:23 is written in a strange way (some attribute this remark to Hagra- the genius from Vilno, but in his books it is not found). Namely. it is written as קוה (Quf, Vav, Hey) instead of the correct קו, while on the margin of the page appears a correction: read קו (Quf,Vav). There are several instances in the Tanach when a word is spelled in one way and is pronounced a little differently. As a rule we don't know the reason for these differences. In our specific case the following explanation was suggested. As well known, the Hebrew letters have numerical values, Alef=1, Bet=2, Gimmel=3, Dalet=4, Hey=5, Vav=6, etc, Yud=10, Qaf=20 Lamed=30 etc., Quf=100, Reish=200 etc. A word has a numerical value (Gematria) equal the sum of its letters. Hence the word קוה (qava) has a numerical value of 100+6+5=111 while the word קו (qav) - 100+6=106. If one multiplies the "wrong" ratio 30/10 written explicitly by the correction קו/קוה=111/106, one obtains the ratio 333/106=3.141509. 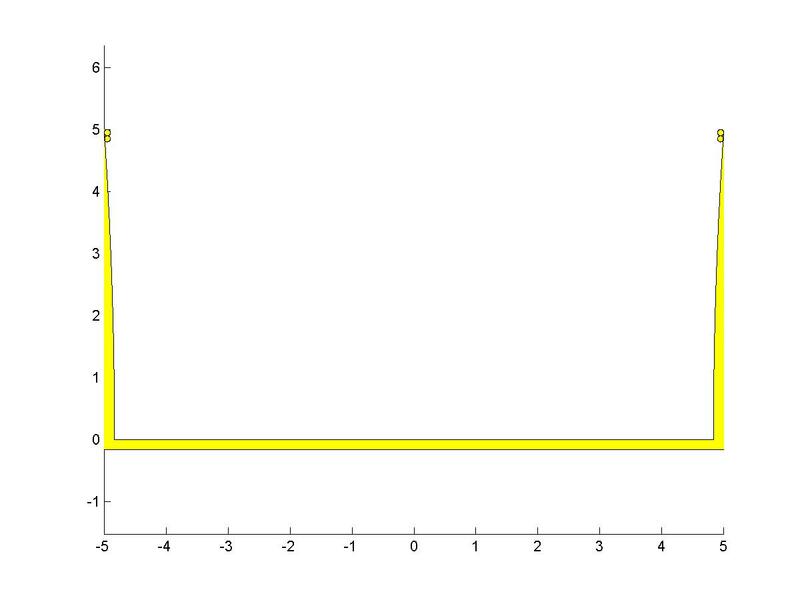 This is an approximation of π=3.1415926… with 5 significant digits. The number π as any number could be expanded into continuous fraction a+1/(b+1/(c+1/(d+…)). In the case of π a=3, b=7, c=15, d=1. The ratio 333/106=3+(1/(7+1/15)) is a second approximation of π. The fist approximation is 22/7, the third is 355/113=3.1415929… It is remarkable that the first three approximations of π are extremely efficient, i.e. they are very close to π while having small denominators. It appears to me that the correction קו/קוה (qava/qav) has not merely numerical meaning. The word קוה (qava) is feminine (in Hebrew the feminine words almost always end with ה) while קו (qav) is masculine. The way the word is spelled is called "masoret"-מסורת and is feminine, the way it is pronounced is called "mickra"- מקרא and is masculine. On the other side, in the pair circle-diameter, the circle represents a feminine, material notion (e.g. the mother Earth) while the straight line represents the masculine, spiritual notion (e.g. the rain that fertilizes the earth). Hence the word קוה (qava) is related to the circle while קו (qav) to the diameter. With this correspondence the verse 7:23 reads "קו (qav) ten cubits from the one brim to the other … and a קוה (qava) of thirty cubits did circle it round about". 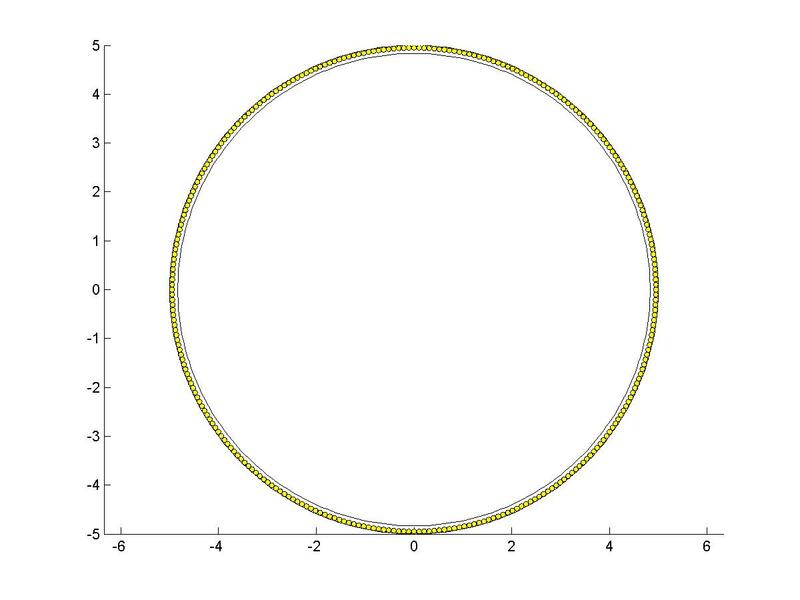 Thus the ratio of a circle to diameter becomes (30xqava)/(10xqav)=333/106. Notice that that all objects in the tabernacle where straight. May be this is the reason why Rambam draw the Menorah with straight branches? If in the "heavens", in the spiritual world, there are no curved lines, the circle is perhaps represented there by a polygon. In case of the perimeter of the circle, the hexagon could serve as a model. In case of the area, the dodecagon could be the model. In the first case the perimeter is equal 2∙3∙radius of the surrounding circle; in the second case the area equals 3∙square of the radius, as if π=3. That is why the Sages considered the equality π=3 not as an acceptable approximation but as a reflection of a certain spiritual truth. The idea that π represents the ratio of feminine to masculine could be demonstrated by the number 135. Doubling of its digits 113355 and separation 113:355 leads to the ratio 355/113 that approximates π with seven significant digits! The analogy is the double faced Adam and his separation into a man and a woman. The same idea could be traced in the volume of kaporet- the cover of the arc. Its length was 2.5 cubits or 15 palms, the width was 1.5 cubits or 9 palms and the thickness was one palm. Thus its volume was 135 cub. palms. Two cherubim, a boy and a girl, where growing out of it, separated by a tiny gap between their wings. The same was the volume of the sockets under the pillars of the tabernacle (their dimension was 4.5x6x6 palms from which one should subtract the volume of the wooden legs of the pillars 1.5x3x6 palms). Two sockets were put on two legs of a pillar and were united by the pillar. We encounter again the number 135 in the plan of the Temple Mount. According to the Mishna Middor (Measures) ch. 2, the width of the inner men's court and of the width and length of the adjacent women's court was 135 cubits. The idea of approximation of π by the ratio 355/113 could be traced also in the holy language. The number 355 is the gematria of the word שנה (Shin Nun Hey)-the year. The length of the 12 month lunar year is also 354-355 days. The yearly cycle represents the circle. The word שנה also means repetition, as returning back around the circle. The number 113 is the gematria of the word פלג (Pey, Lamed, Gimmel), which means half or division into parts. The same is the gematria of the word חציה (Chet, Zadi,Yud, Hey) – halving. Indeed, diameter divides the circle into two equal parts. Thus the fraction 355/113 represents the ratio of the circle to the diameter. Let us discuss now the volume of the molten sea. As already mentioned above, this volume according to Kings I 7:26 was 2000 bat or 450 cub. cubits. However, the volume of the cylinder of the diameter 10 and the height 5 cubits is π52∙5=392.7 cub. cubits. If one assumes according to the Talmud Eruvin 14a that the lower three cubits of the sea were a square of 10 by 10 and the upper two cubits were a circle with diameter 10, then one obtains the volume 300+ π52∙2=457.08 cub. cubits. One can suggest that the Scriptures rounded down this number to 450, or adjusted it to the approximation of π by 3. But, since a hidden deep meaning was found in the perimeter of the sea, we will try to find such meaning also in the volume of the sea. For that sake one should first understand by what cubits the sea was measured. It is written in Talmud Iruvin 83a that the unit of volume "seah" (equal to 3/40 cub. cubits) increased in Jerusalem by a factor 6/5. Talmud does not mention that the length of the cubit increased too. The generally accepted length of the cubit of Torah is 48 cm (so called measure of Rabbi Haim Nae). "Competing" with it is so called measure of Hazon Yish which is 6/5 times longer. Lately, by studying the length of the cubit mentioned in the book of Ezekiel (Ch. 40) and its relation to the size of the Land of Israel, I came to a conclusion that this cubit is exactly 51 cm (see the abstract and other material on the site www.truthofland.co.il in Hebrew and English). Since, by Ezekiel, the altar in the Third Temple will be measured by this cubit and since (according to Rambam) the size of the future altar will be the same as it was in the Second Temple, we infer that the Second (and hence the first) Temple was measured by the cubit of 51 cm. Notice that the increase of the cubit by factor 51/48 results in the increase of the volume by factor (51/48)3=1.19946... . For practical matters this number is equal to the ratio 6/5=1.2 between the unit of volume in Jerusalem and the unit of volume of Torah. We are driven to a following conclusion: King Solomon has increased the length of the cubit from 48 to 51 cm and accordingly increased the unit of the volume by factor 6/5. Why then the Talmud does not mention the increase of the cubit? Because this increase does not fit exactly the increase of the volume! Nevertheless, the Sages mention in the Midrash Rabba 31,10 that the Temple was measured by a special cubit used by Noah in his Ark. Now we understand the meaning of the cubit of Hazon Yish. The above mentioned Talmud Iruvin 83a says that as the Sanhedrin moved to the town of Zippory, the Sages increased the unit of volume of Jerusalem by factor 6/5 from. Let us add that in our time, under the influence of Hazon Yish, the unit of volume in Bnei Brak was increased once again by factor 6/5. The threefold increase of the volume by factor 6/5 is equivalent to a one time increase of the cubit by the same factor. This is how the cubit of 6/5x48 cm appeared. The volume of the sea is V=πr2h-V1=375.474696 cub. cubits of 51 cm. If we translate them into cubits of 48 cm, we obtain 450.36796 cub. cubits. It is almost the requested number. But we did not pay attention to the fixtures of the sea. The verse 7:24 reads "and under the brim of it round about there were knops (peqaim in Hebrew) compassing it, ten in a cubit, compassing the sea round about; the knops were in two rows, cast with it in the same casting" (see the view from above). Perhaps these knops were cast in the walls from inside and thus decreased the volume of the sea? The word peqaat in Hebrew means something round, apparently a ball. If ten of them were in one cubit then the diameter of each one was 1/10 cubit. Interestingly enough, the ancient Aramaic translation of Jonathan ben Uziel calls these peqaim- eggs. By definition, the volume of an egg is 1/1920 of a cub. cubit. The volume of a ball of diameter 1/10 is 4/3π(1/20)3=1/1909.86. If one approximates π by the ratio 25/8=3.125 then one obtains exactly 1/1920. How many balls were in a row? If we calculate the perimeter of the brim by the correct value of π, we obtain 314.5 balls. Most likely the number of balls was "round", 300. The perimeter of 30 cubits as stated by the verse 7:23 could hint to this number of balls. There is no contradiction between this number of balls and the actual perimeter- there were small gaps between the balls. Two rows of balls – total of 600. However, since the balls were immersed partially into the thickness of the walls, we should subtract the volume of the immersed part. We will assume that the upper row of balls was sitting just below the brim and the second row right below the first one (see the side view). Then the center of the balls of the first row lies 1/20 cubit below the brim and of the second row 3/20 cubits below the brim. The thickness of the wall there is correspondingly 0.0033 and 0.0099 of a cubit. The immersed volume of the first row is equal approximately to a volume of one ball and of the second row- about 8.2 balls. High accuracy numerical integration gives respectfully 1.03 and 8.30, together 9.33 balls. Hence we should subtract from the volume of the sea 590.67 balls. With a volume of a ball 1/1909.86 cubic cubits, we obtain the volume of the sea 375.165422 cub. cubits of 51 cm or 449.99700 cub. cubits of 48 cm. If we count the ball as an egg of 1/1920 cub. cubits, we obtain the net volume of the sea 449.999 instead of 450.0. A relative error of 1/500,000! Of course, this is a theoretical accuracy since a copper vessel would expand under the pressure of water and even the water would compress under its own pressure. Let us summarize the results of our investigation. Obviously, King Solomon knew not only the value of π with high accuracy but was also able to calculate the volume of a body of rotation with 6 digits. But we are talking here not about human wisdom but of divine wisdom. No human mind could design a vessel of such simplicity and harmony and at the same time arrive at a "round" volume with 6-digit accuracy. Also the play of words with the line קוה/קו (qava/qav) which corresponds to the approximation of π by a continuous fraction, should have been built in the Hebrew language. Our story would be incomplete if we will not bring the reaction of critics. What do they say? The pair of words קו/קוה (qava/qav) appears in the Scriptures in two more places: in Jeremiah 31:38 and Zachariah 1:16. In both cases the text does not talk about the length of a circle and the number π. Hence the difference between the spelling and the reading of this word does not have the meaning we attributed to it. What can we reply? The same word or group of words could be used in different places to code different things. The fact that we don't understand the coding in one place does not diminish our understanding in another place. Yet, I will suggest an interpretation of this pair of words in the above two places. In both cases the text talks about the future expansion of Jerusalem. This expansion is described in detail in Ezekiel Ch. 45 and Ch. 48. The future Jerusalem, more precisely the oblation (truma) from all the tribes will be a square of 25,000 by 25,000 measuring rods (see there the verse 48:20 and the map). Since the measuring rod is 6 cubits long, the size of the oblation is 75 by 75 mils (one mil equals 2000 cubits; according to my calculation it is 1.02 km). This square will be divided in three parts. The northern 30 mils will belong to the priests (cohanim), the next 30 mils will belong to Levites and the southern 15 mils will belong to the servants of the city. The Temple will be in the middle of the part of the priests. To the west and to the east of this square will extend the domain of the King-"Nassi". To the north of the square will be the land of seven tribes and to the south of it –the land of five tribes. Each tribe will be allocated a strip of land of the same width: 75 mils from north to south. With additional information (see abstract § 11) it was possible to reconstruct also the western and eastern borders. It turned out that the land allocated to 12 tribes is exactly 400 by 400 mils. However, the Talmud says in several places (e.g. Megila 3a) that the territory of Israel is 400 by 400 parsa, where parsa is 4 mils. Thus the territory of Israel should be 16 times bigger. We did not count yet the area of the strip of the King. Ezekiel does not say how far it extends to the west and east. Could it be that this strip, which is 75 mils from south to north, surrounds the whole world? The Talmud (Chulin 91a) says that the ladder of Jacob with the angels ascending and descending on it, was 8000 parsa wide (two angles ascending and two descending, each angel 2000 parsa wide). Regarding the length of the ladder, Rashi (the main commentator of the Torah) writes in Genesis 28:17 that the basis of the ladder stood in Beer Sheba while its head was in Beit El (the source of Rashi is in Bereshit Rabba 69:7). Notice that the southern border of the square of the oblation passes through Beer Sheba while the northern one passes through Beit El. Could the ladder of Jacob symbolize the strip of the King-Messiah around the world? That is why exactly in this place (Gen. 28:14) G-d promised Jacob "and thou shalt spread abroad to the west, and to the east, and to the north, and to the south". To the north and to the south- the 12 strips of the tribes, to the west and to the east- the strip of Messiah. If our interpretation is correct, the perimeter of the strip of Messiah around the world should be 8000 parsa, i.e. 32000 mils or 32640 km. Notice a surprising fact. It the strip of Messiah has perimeter of 32000 mils, its area is 32000x75 mils. Add to it the calculated area of the 12 tribes (which does not include the area of the oblation) and we obtain 400x400 + 32000x75=1600x1600 sq. mils, exactly as claimed by the Talmud. Now let us calculate the perimeter of the strip of Messiah. The Temple Mount, more precisely, the center of the Holy of Hollies lies near the center of the Golden Dome, at the latitude of 31.777719°. The southern border of the oblation is 60 mils or 61.2 km south of it, at the latitude of 31.2258° while the northern border is 15 mils north of it, at 31.9157°. The middle of the strip of Messiah is thus 22.5 mils south of the Temple, on the latitude of 31.57074°. The cross-section of the Earth on this latitude is a circle with the radius of 5439.132 km. The perimeter of this circle is 34175.075 km or 33504.976 mils. It is close to 32000 mils but not very. May be the width of the ladder was calculated based on π=3? The ladder led to the heaven and there, according to our understanding, π=3 (in other words, the ladder was a hexagon inscribed in this circle)! Multiple the above radius by 6. We obtain perimeter of 31994.89 mils. Not a bad accuracy! It is possible that the ladder surrounded the Earth not on the sea level but on the level of the mountains of Israel. Approximately at the latitude of 31.57°, to the north of Hebron lies the highest point of Judea, 1020 m above the sea level (this is exactly one mil, a basic measure in Judaism). On that level one should add to the radius of our circle 1.02cos 31.5707=0.869 km. The resulting radius will be 5440.001 km and the perimeter (with π=3) 32,000.006 mil. This is an incredible accuracy, beyond the definition of the radius of the Earth. All this is remarkable, but what has it to do with the ratio קו/קוה (qava/qav)? The strip that surrounds the future oblation of Jerusalem around the world is akin to a bride that circles around the groom under the canopy. The spelling of the word curve קוה (qava) is feminine and corresponds to the the bride. The reading קו (qav) is masculine and relates to the groom, the square of Jerusalem. In order to bring these two measures to a common denominator - the area of Israel, one should multiply the feminine strip around the world by the ratio קוה/קו (qav/qava), i.e. 3/π and add to the area of the 12 tribes. If one does not like the idea to raise the ladder of Jacob to the top of the mountains of Judea, we can suggest a different solution. Out of the above exact perimeter at the sea level of 33504.98 mils, 75 mils of Jerusalem are "masculine" and the rest 33429.98 are "feminine". The last number should be multiplied by the ratio קוה/קו (qav/qava) equal 106/111 and added to 75. We obtain then 31999.12 mils. A remarkable accuracy! The inevitable conclusion is that the one, who designed this equality, had a full control of the size of the Earth and of the geography of Israel.